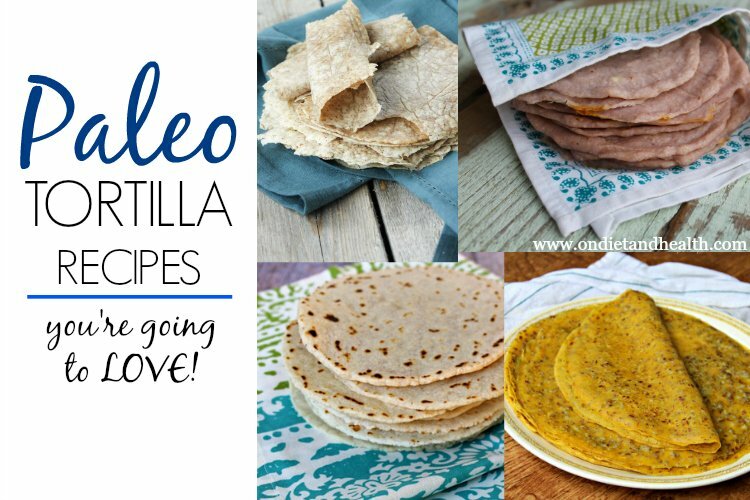 Paleo tortilla recipes from some favorite Paleo Diet bloggers! Though not exactly like prepackaged ones at the store or restaurant, they’ll get the job done without the digestive distress that gluten or corn causes. They’re all gluten-free and grain free. Yay! Check out these creative ingredients and cooking techniques for making a versatile paleo tortilla or Naan bread. Along with almond flour and coconut flour you’ll find tapioca flour, sesame seed flour, cassava, flax, sweet potato and plantains. Why tortillas? Because I’m from Texas, first of all! But also because they’re a tasty and fun addition to most any meal. And they’re the best vehicle for food next to a fork! Get creative and pile on anything you can think of from sausage and eggs (breakfast taco style) to pulled pork and cilantro. Use them as “chips” to dip into homemade guacamole. Wrap them around your favorite sandwich ingredients. The possibilities are endless… Make sure to read the comments below these recipes to find great tips and updates. 1. Simple Paleo Tortillas. This recipe from Stupid Easy Paleo is a classic. The dry mix consists of arrowroot starch and coconut flour. These are more of a crepe style than a tortilla as they are swirled in a pan until very thin. They cook up quickly and freeze well. 2. Cauliflower Tortillas You’ll Love Totally easy mini-tortillas to pick up bites of your favorite foods. Created by teenager Joshua Weissman of Slim Palate. 3. 3 Ingredient Paleo Naan Bread. Another popular paleo recipe is from Ashley at My Heart Beets. This Naan “bread” pairs perfectly with any traditional Indian dish but can also be used as a tortilla or wrap. And with only 3 ingredients, it couldn’t be simpler! Ashley has a video on this and offers other recipes using this. 4. Paleo Tortillas. An easy recipe from the Paleo Cupboard using almond and tapioca flours. You’ll get a flexible but strong tortilla that can be filled with all sorts of things! The author recommends a tortilla press which you can find online here. 5. 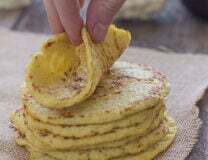 Grain Free Tortilla Shells. Flaxmeal and Cassava flour are the base in this nut-free tortilla shell from Simple Roots Wellness. 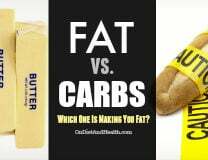 Cassava flour is relatively new to the paleo scene and is popping up in recipes around the web. It’s no wonder, as its consistency is really close to wheat flour. This yields a less gummy and more fluffy tortilla. 6. Secret Ingredient Baked Paleo Tortillas. This recipe from Whole New Mom calls for only four ingredients, two of which are surprising but still easy to find in most grocery stores. I especially like that you can bake these instead of cooking on the stove. 7. Paleo Tortillas. 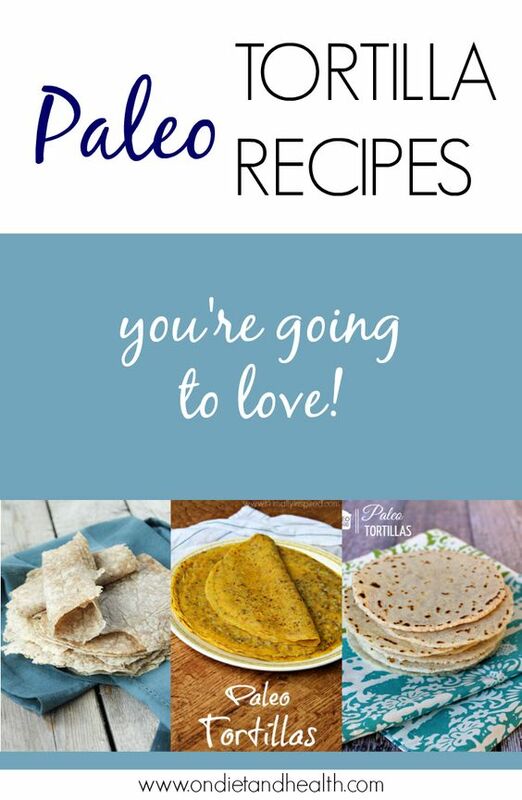 These pliable tortillas from Primally Inspired have an extra boost of nutrition (and color) with a surprising ingredient: pumpkin! The pumpkin can be substituted with mashed sweet potatoes, another nutrient dense food. Kelly gives suggestions for giving them a sweet or savory flavor depending on how they’re used. 8. Coconut Flour Crepes. These crepes are starch free, making it a safer option for those of us with sensitive digestive systems. Although Dr. Meghan Birt suggests these as a vehicle for breakfast type foods (almond butter, berries, whipped coconut cream), they can certainly be used for savory dishes as well. Double the recipe and freeze the extras for a quick snack. 9. Paleo Plantain Tortillas. Plantains are readily available in most grocery stores and look similar to a banana. Simone from Zen Belly Catering shows a simple technique for blending the ingredients and baking in the oven. She suggests using these as a wrap for school lunches as they’re small but soft and pliable. Paleo tortillas are a perfect make-ahead item you can cook in bulk and freeze. Cook once… eat two (or three or four) times! Of course, as with anything moderation is key. These paleo tortilla recipes tout healthier ingredients than their traditional counterparts but should never make up the bulk of your diet.